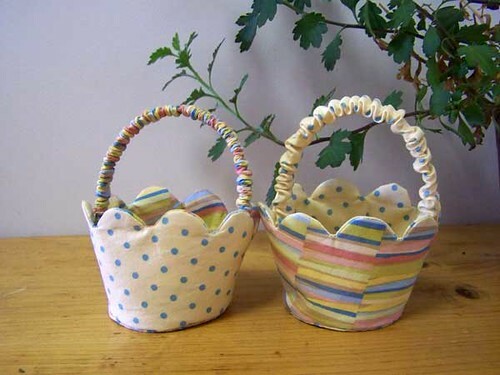 I made a pair of little fabric baskets using a pattern in Handmade magazine. Vol 27 No. 9 to be precise. It claims to be a Collector’s Edition of Quick Weekend Crafts. I collected it from my local library so I’ll have to return it to their collection. Must be a Collector’s Edition indeed. The pattern said to cut two circles from template plastic to stiffen the base… I used the clear covers yanked off some comb-bound booklets the kids had from school last year. There’s a thin strip of that stuff inside the handles, too. The scallop top edges are a bit fiddly. I think they would be almost as cute with just a straight top edge. I especially thought that after I sewed one of them through only the outer fabric and interfacing. I forgot to layer on the lining fabric that I was supposed to be stitching it to. Um, yeah. Not very effective. Try again. A bit fiddly with handsewing on the bases, but not too bad overall. They look like Easter Baskets to me. These are just so gorgeous. And I see my local library catalogue has a copy. Making note to self to remember to borrow it. They’ll make perfect gift baskets for an event coming up later in the year. Thank goodness for ‘lead time’. Hey! Look at that fabric! Glad you like it.